When I was in high school I became enamored with a drama class. It was purely happenstance, as there was no other elective available for the last period of the day besides Spanish. In Arkansas two decades ago, I didn’t feel a great need to know Spanish. Drama won out. I am secure enough to admit I was a horrible actor. I never got cast in any production. My projection was weak. My suspension of disbelief was lacking. Still, I was intrigued by the notion of disappearing into a character. Exploring a whole other world and living the life of another person. Being something other than I was. Something better, more interesting, more enjoyable. The drama masks, smiling and frowning, represented a world a possibility limited only by the imagination. 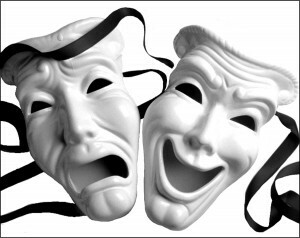 I forgot all about the drama masks until the mid 2000’s, when I met a drama therapist by the name of Lori Yates. She was a social worker at North Texas State Hospital, a maximum security forensic hospital. Lori is quite the therapist, willing to try anything and everything. Plus she is quite the cut up. Drama therapy obvious was a fit for her. One of her techniques was to have patients craft masks and then wear them during productions of their own creation and direction. Some of the masks at the hospital were extraordinarily beautiful, reminiscent of Mardi Gras or a masquerade ball. Others were dark and scary, and clearly represented pain and tragedy. All were intriguing. Masks do serve a purpose. In sports, we wear masks and faceguards to protect delicate features and reduce the risk of injury. More often, though, masks are for hiding our identity…which can be a variation on protection if we think about it in terms of protecting ourselves from the ramifications of our choices. Superheroes were masks to protection their friends and family. Criminals and various bad guys where masks to keep from being caught. At Halloween we wear masks to be rewarded with candy…and as adults to (hopefully) hide some of our suboptimal behavior. 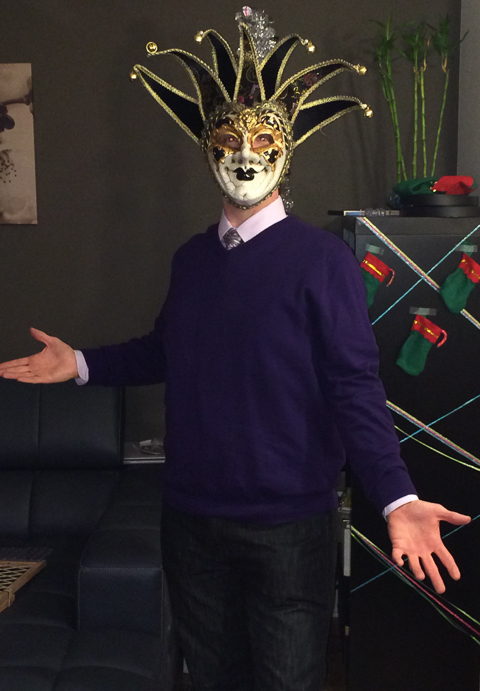 This past New Year’s Eve, I myself wore a mask. The whole night I disappeared behind this mask, surrounded mostly by strangers who had no idea of my identity. It was quite liberating. I danced more freely than I had in years. I was not afraid to look around and see people. I didn’t shy away or avert my gaze. I observed. I witnessed. And then I imagined that probably most people wearing masks were having a more free experience than usual, just like me. 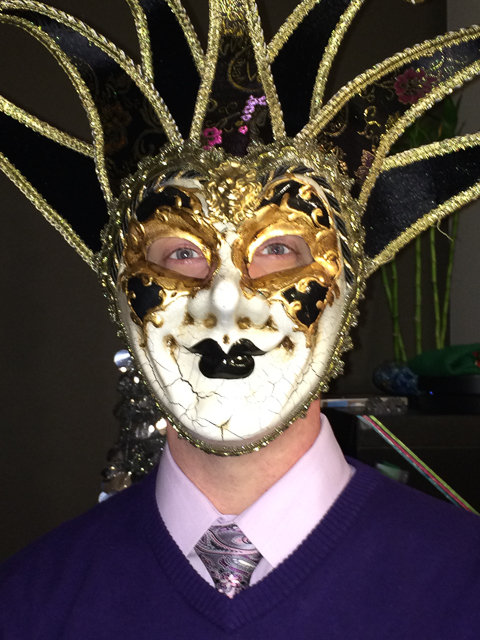 When I saw the pictures from NYE, I was struck by the thought that we live our lives behind masks. Physically invisible, but role-defining nonetheless. I “act” a certain way during therapy sessions. I’m different when playing softball. I’m more liberated when dining and drinking with friends. Somber and contemplative in church. At home with my partner and cats, I am probably something very few people have ever seen. Each role of my life is a variation on the core of who I am as a person. The physical masks may be gone, but still I live as different people depending who needs me and what I need. I’m not sure I like this. As therapists, we frequently advise our clients to live genuine and authentic lives. We say this from an authoritative role of expertise based on training and experience. And quite likely there is the assumption that therapists live mostly perfect lives because of out training and experience. (If you only knew!) Who you are should be consistent in your life, or so we say. Imagine the shock and awe of having my best friend point out that I was willing to tolerate deplorable manipulative behavior from another friend because I was afraid to rock the boat. My bestie pointed out that this was not the first time, and I had tolerated similar behavior on the softball field. Though he did not make all the connections for me, I was well able to see it in myself. In my different roles, while wearing different masks, I had set up different standards of how I was to be treated. We all do it. Thinking about your roles. Think about the masks you wear. What do you expect as a wife or a husband? As a mother? As a child? How about as a manager or an employee? As a parishioner? Neighbor? What about as a friend? Now here’s the real question….are your expectations for how you are treated consistent across all those roles? Does it change depending on what mask you wear? 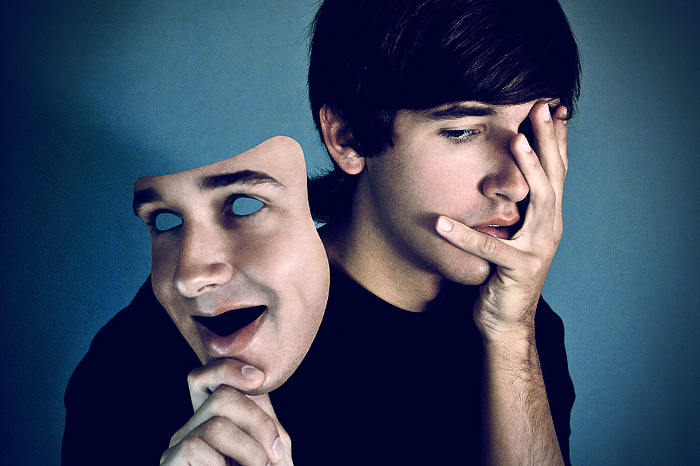 Do you wear masks to hide from your own disappointment that you are not living your values? If I’m honest, this definitely applied to me. I didn’t realize it for a long time. And now that I think about what Lori was doing with those masks in the hospital, I see the real impact. Those patients had to express their needs wearing the masks so that they felt safe to build up to making healthy and assertive demands without the masks. Lori was teaching them to not hide behind roles and masks, and to see themselves as whole persons. Not broken and fragmented, and not having to play games to meet their needs Intellectually I get it; practically, I’ve been lacking in my own execution. Today I’m giving myself the same homework I’d give a client. I’m making a list of my core values and beliefs, what I want for my life and my world. And them I’m making a list of all my roles. Each role where I am not living my truest life gets a higher level of scrutiny so I can see where I’ve sold myself out. With insight and awareness comes the need to change something. Either my expectations or my actions. I’m pretty confident it will be my actions and that all of my roles will firmly reflect who I am as a whole and healthy person and I can stop wearing masks. I invite you to try this exercise as well. Let me know what you discover about yourself when you stop hiding behind the masks.